The U.S. average retail price of diesel climbed 2.5 cents to $3.118 a gallon as crude oil hovered around $64 a barrel, the Department of Energy reported April 15. Diesel now costs 1.4 cents more than it did a year ago, when the price was $3.104 per gallon, DOE said. Prices rose everywhere, with the sharpest increase on the West Coast, where they climbed 6 cents to $3.651. Gasoline had a sharper jump, 8.3 cents to $2.828 per gallon. Gasoline is now 8.1 cents more expensive than a year ago. The jump in gasoline was the highest on the West Coast, where it jumped 16.1 cents in one week. Oil edged higher as investors weighed tightening global supplies against expectations for another boost in U.S. crude inventories, according to Bloomberg News. On April 16, futures at the New York Mercantile Exchange gained 1%, after wavering between gains and losses. Stockpiles, already at the highest since 2017, are set to rise for a fourth week, according to a Bloomberg survey. Gasoline inventories, however, are forecast to fall for a ninth week. Oil has rallied around 40% this year as the Organization of Petroleum Exporting Countries and allied producers including Russia cut output. While involuntary losses in Iran, Venezuela and Libya have further restricted supply, record U.S. shale-oil production and signs of increased drilling activity are complicating OPEC’s efforts to rebalance the market, according to Bloomberg. West Texas Intermediate for May delivery rose 65 cents to $64.05 a barrel on the Nymex at the close of the trading session, after falling to a one-week low a day earlier. Strong U.S. oil production is why top analysts doubt that even with higher gasoline demand during the coming warmer months, in the United States and globally, that oil will approach $100 per barrel. Instead, oil production will continue to ramp up as demand also rises, one expert told Transport Topics. Denton Cinquegrana, chief oil analyst for the Oil Price Information Service, said he sees the United States helping meet world demand by becoming a net exporter of petroleum products. And Cinquegrana said it is possible U.S. oil production could hit new highs — of up to 25 million barrels per day — in the next decade, a production high once thought unachievable. Cinquegrana said higher retail prices for diesel and gasoline can be explained by expected refinery maintenance schedules as well as some particular refinery problems that most impacted the West Coast. Still, while prices seem stable now, experienced energy traders have seen prices go from steady to volatile. Sometimes the cause is not production, but weather or politics, according to Bruce Dean, chief operating officer of Genesis Fuel Corp. of Chicago. IMO is set to phase out bunker fuel Jan. 1 in favor of a cleaner fuel. Because bunker fuel, used by ships, comes from the same distillate as diesel, the change could put pressure on retail diesel fuel prices — potentially pushing them up. “The upward pressure [IMO rules] could put on diesel could be huge,” Dean said. Genesis Fuel began business recently after years of research on diesel pricing, Dean told TT. 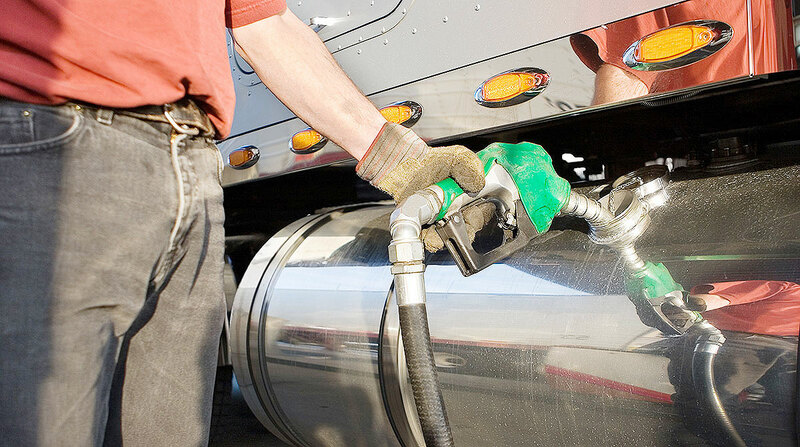 The company sells fuel cards that charge trucking firms a price based on diesel prices along various trucking routes. The company then adds 30 cents a gallon and locks in prices through the ups and downs of the diesel pricing cycle, Dean said. Ultimately the goal of the company is not just to help trucking firms reduce costs, but to have a competitive advantage over other trucking firms, he said. The company opened its doors Feb. 19 and has nine employees. Dean said the company’s CEO, Steve Schmidt, decided to work on eliminating variable fuel prices for firms after a trucking official told him lower diesel prices help all trucking firms but do nothing to add a competitive edge to particular companies.